Download "PILOT PROGRAM IMPLEMENTATION Position Posting and Employment Guidelines. Human Resources Associate. Class Code: 5020"
1 PILOT PROGRAM IMPLEMENTATION Position Posting and Employment Guidelines Human Resources Associate Class Code: 5020 Beginning October 1, 2002, the State Universities Civil Service System has granted authority for the implementation of a new Pilot Program that includes the creation and use of the new Human Resource Associate classification. 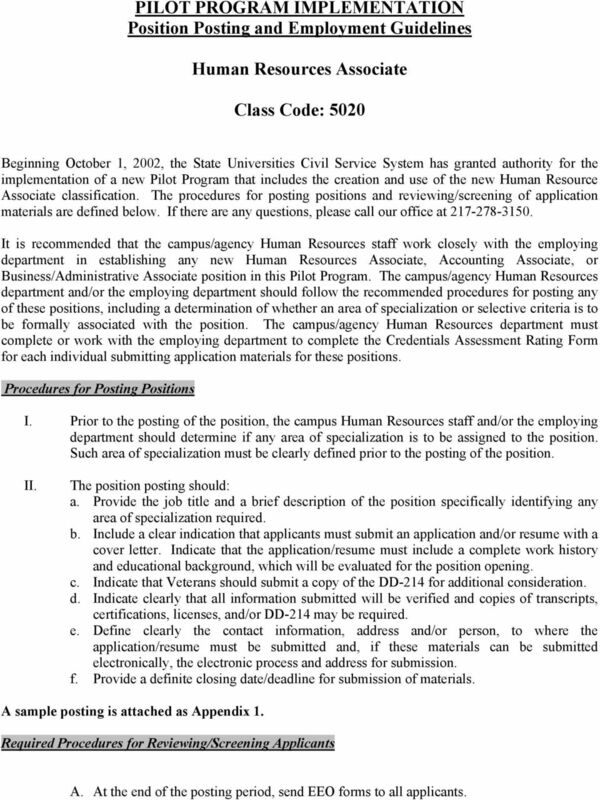 The procedures for posting positions and reviewing/screening of application materials are defined below. If there are any questions, please call our office at It is recommended that the campus/agency Human Resources staff work closely with the employing department in establishing any new Human Resources Associate, Accounting Associate, or Business/Administrative Associate position in this Pilot Program. The campus/agency Human Resources department and/or the employing department should follow the recommended procedures for posting any of these positions, including a determination of whether an area of specialization or selective criteria is to be formally associated with the position. The campus/agency Human Resources department must complete or work with the employing department to complete the Credentials Assessment Rating Form for each individual submitting application materials for these positions. Procedures for Posting Positions I. Prior to the posting of the position, the campus Human Resources staff and/or the employing department should determine if any area of specialization is to be assigned to the position. Such area of specialization must be clearly defined prior to the posting of the position. II. The position posting should: a. Provide the job title and a brief description of the position specifically identifying any area of specialization required. b. Include a clear indication that applicants must submit an application and/or resume with a cover letter. Indicate that the application/resume must include a complete work history and educational background, which will be evaluated for the position opening. c. Indicate that Veterans should submit a copy of the DD-214 for additional consideration. d. Indicate clearly that all information submitted will be verified and copies of transcripts, certifications, licenses, and/or DD-214 may be required. 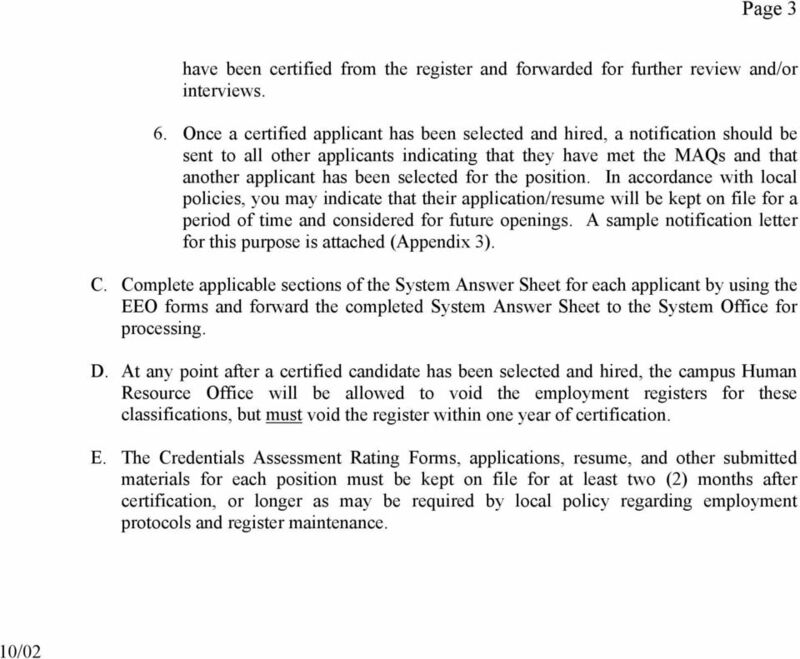 e. Define clearly the contact information, address and/or person, to where the application/resume must be submitted and, if these materials can be submitted electronically, the electronic process and address for submission. f. Provide a definite closing date/deadline for submission of materials. A sample posting is attached as Appendix 1. 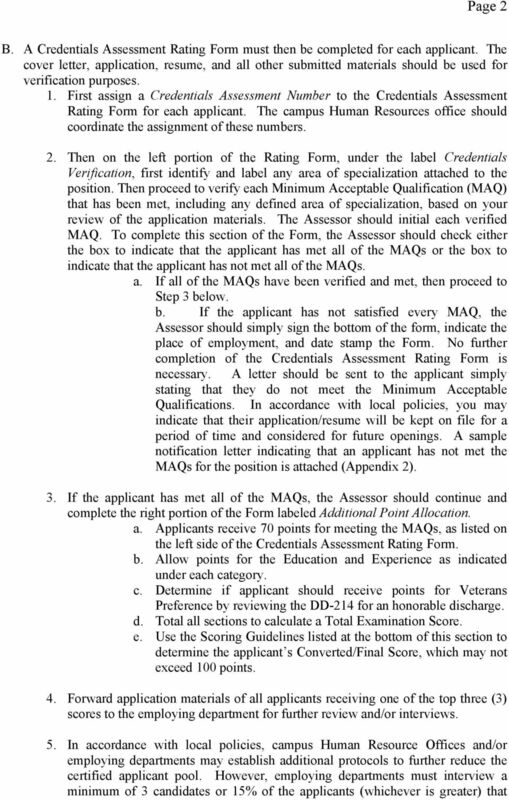 Required Procedures for Reviewing/Screening Applicants A. At the end of the posting period, send EEO forms to all applicants. 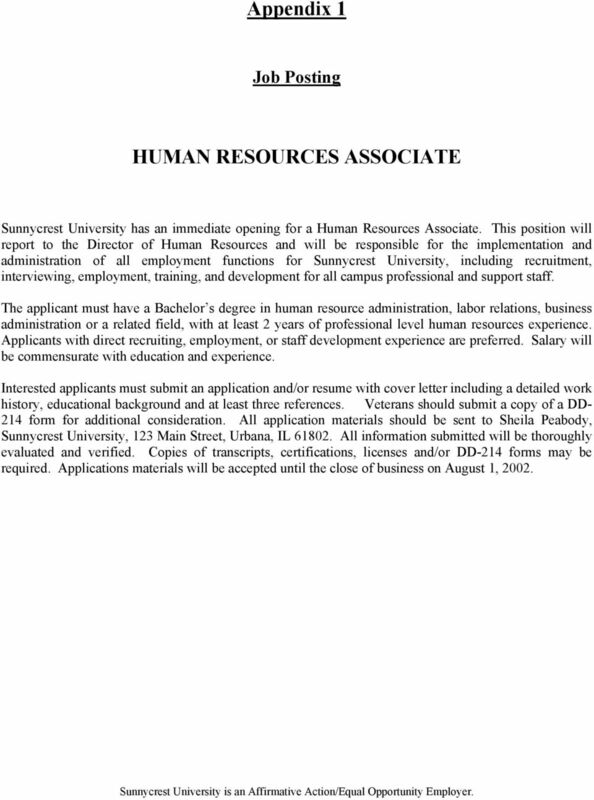 4 Appendix 1 Job Posting HUMAN RESOURCES ASSOCIATE Sunnycrest University has an immediate opening for a Human Resources Associate. This position will report to the Director of Human Resources and will be responsible for the implementation and administration of all employment functions for Sunnycrest University, including recruitment, interviewing, employment, training, and development for all campus professional and support staff. The applicant must have a Bachelor s degree in human resource administration, labor relations, business administration or a related field, with at least 2 years of professional level human resources experience. Applicants with direct recruiting, employment, or staff development experience are preferred. Salary will be commensurate with education and experience. Interested applicants must submit an application and/or resume with cover letter including a detailed work history, educational background and at least three references. Veterans should submit a copy of a DD- 214 form for additional consideration. 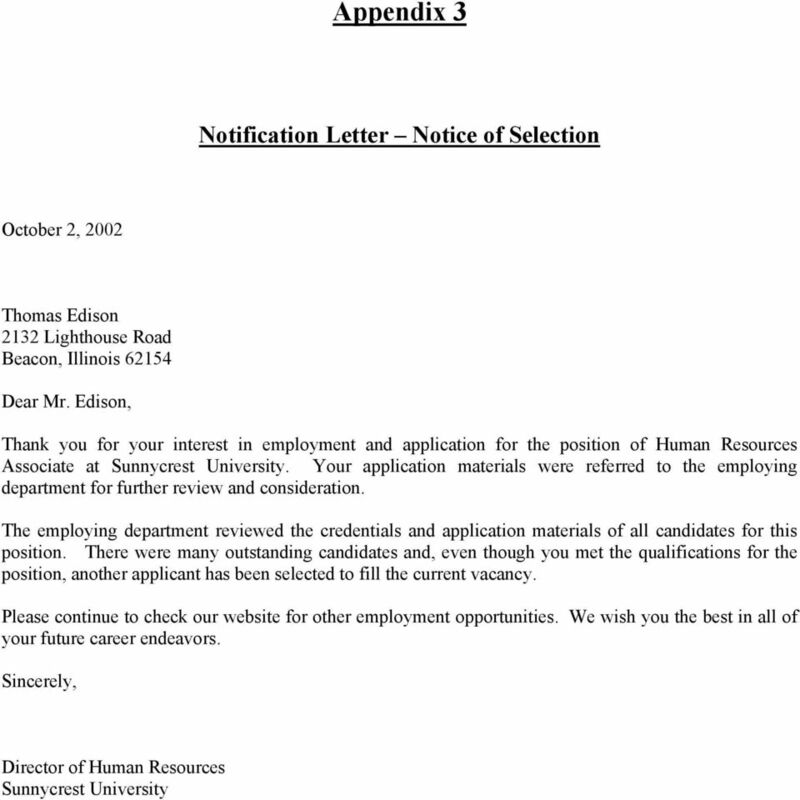 All application materials should be sent to Sheila Peabody, Sunnycrest University, 123 Main Street, Urbana, IL All information submitted will be thoroughly evaluated and verified. Copies of transcripts, certifications, licenses and/or DD-214 forms may be required. 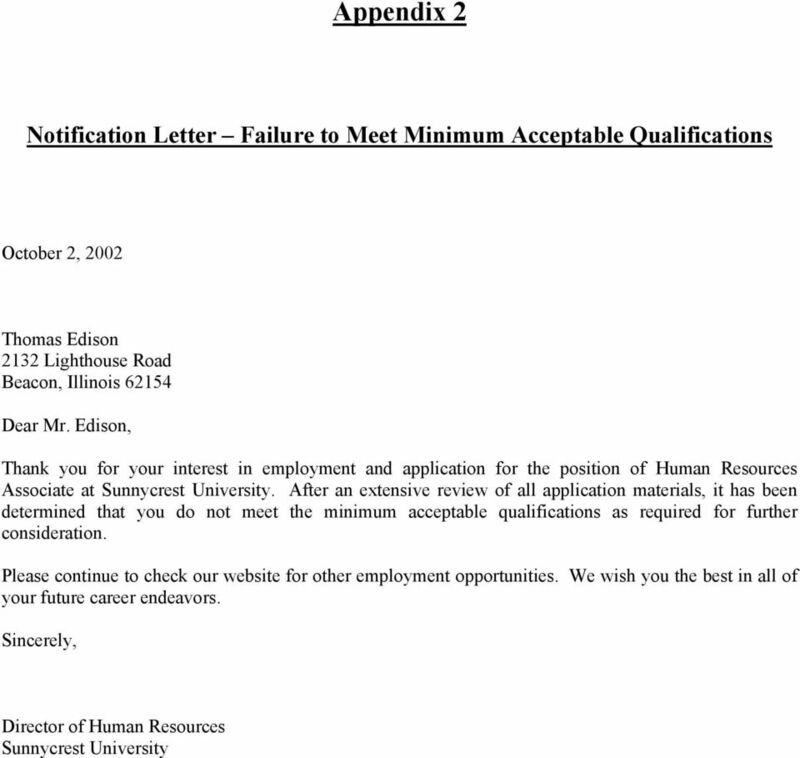 Applications materials will be accepted until the close of business on August 1, Sunnycrest University is an Affirmative Action/Equal Opportunity Employer. FORM OF RETENTION. PERIOD OF RETENTION a. Six months from date record made or personnel action taken, whichever is later. A Leon County Employment Application is required in all cases. A separate application must be made for each position applied for. FULL-TIME FIREFIGHTER/PARAMEDIC EMPLOYMENT OPPORTUNITY Beginning February 6, 2015, the Winfield Fire Protection District will be accepting applications for the position of full-time firefighter/paramedic. CENTRAL TECHNOLOGY CENTER SURGICAL TECHNOLOGY APPLICATION PACKET Read admission procedures for application process. Admission procedures, eligibility, cost requirements are subject to change annually. Teach a variety of subjects related to law enforcement and the criminal justice system. Dear Applicant: Little Big Horn College 8645 S. Weaver Drive P.O. Box 370 Crow Agency, Mt 59022 Phone: (406) 638-3100 Fax: (406) 638-3169 Thank you for your interest in employment at Little Big Horn College.